JBL BassPro Hub | 11" (279mm) Spare tire subwoofer with built-in 200W RMS amplifier with remote control. 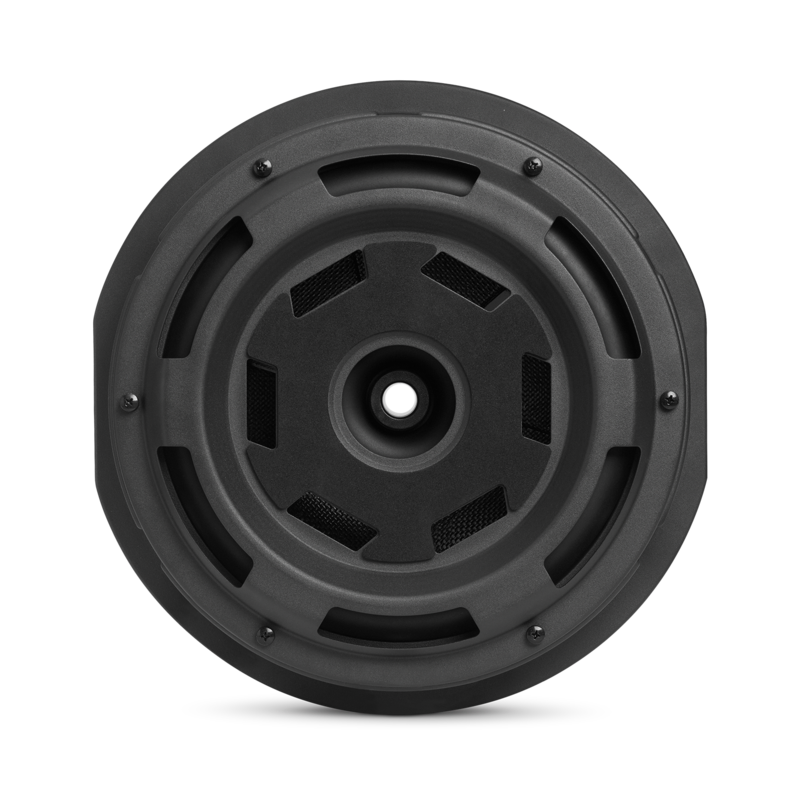 The 11" (279mm) woofer cone is engineered to deliver fast and tight, deep bass with low distortion and unwanted second and third order anomalies. The JBL subwoofer system’s built-in amplifier is optimized to work as a system with the woofer. 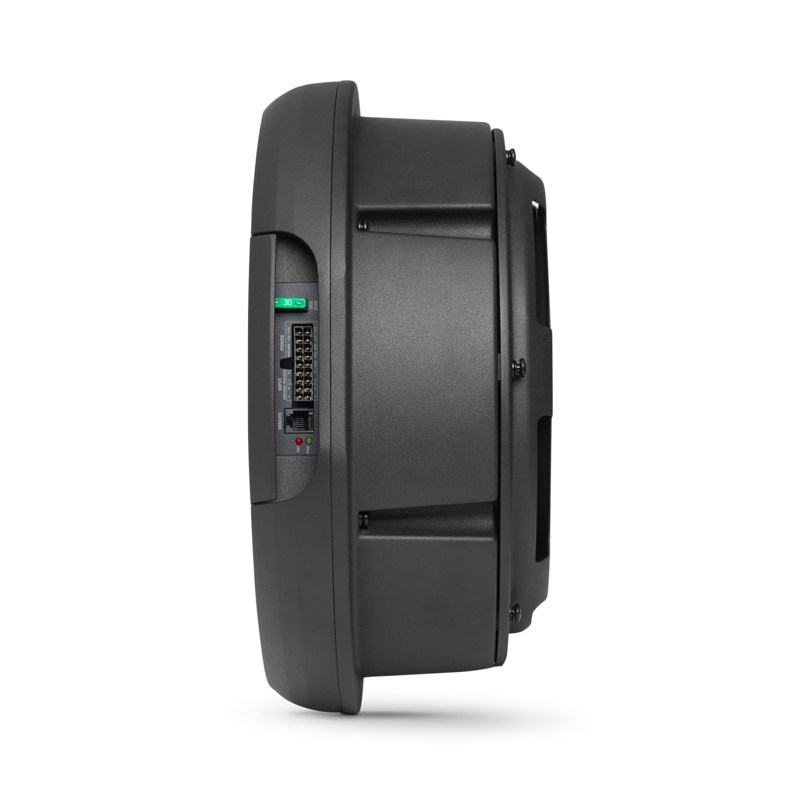 Its Class D design runs cooler and draws less current from your vehicles electrical system making it the perfect concealed subwoofer solution. Gain control adjusts the volume level right from the drivers seat. Phase switch changes the input phase to inverted or noninverted. (This can sometimes be helpful for troubleshooting.) 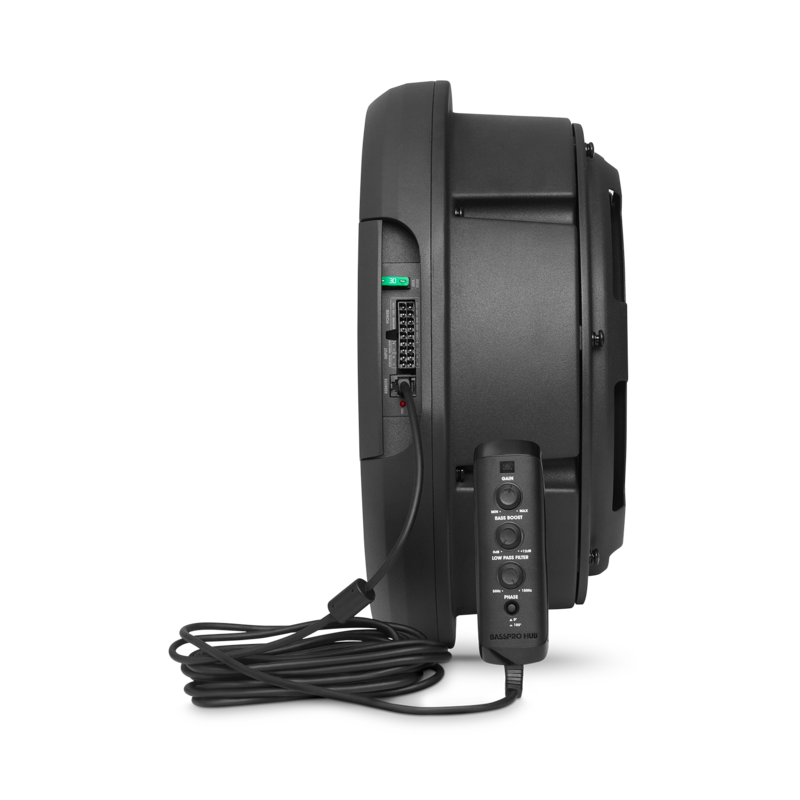 Crossover frequency control adjusts the crossover frequency to any point between 50Hz and 150Hz. Bass EQ control provides 12dB of boost. 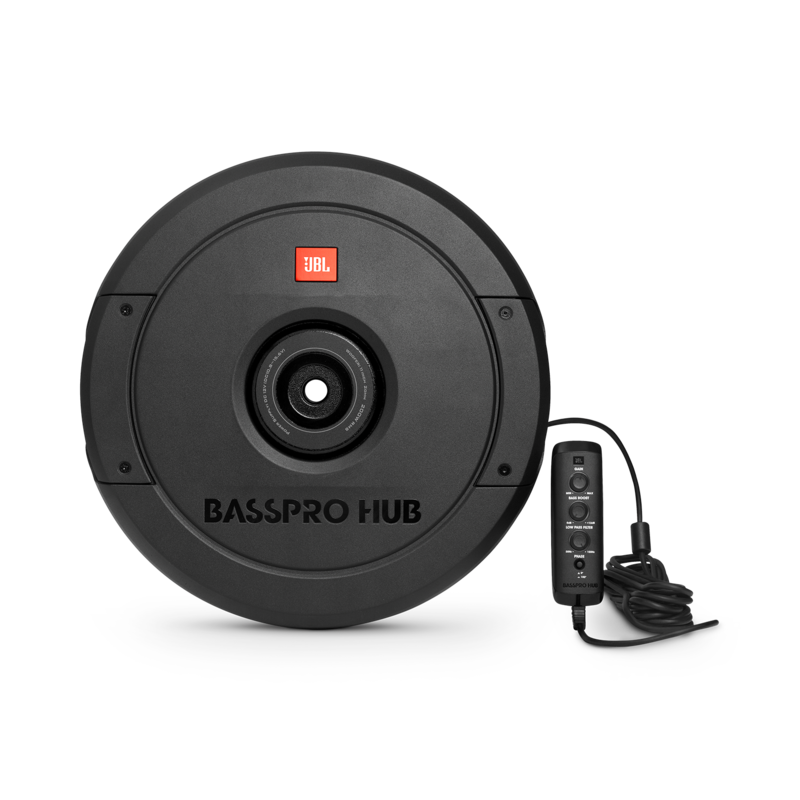 The JBL BassPro Hub has line level inputs and speaker inputs that allow you to connect it to any car audio system making it a great upgrade to your factory system or the bass foundation of the aftermarket system of your dreams. JBL speakers have to undergo a testing process that would destroy lesser speakers. JBL freezes them, bakes them, shakes them, blasts them with ultraviolet light and drives them at full power for days at a time. This is JBL—the legendary speaker and sound company that has excited audio enthusiasts for over seventy years. There's nothing better than riding with JBL. 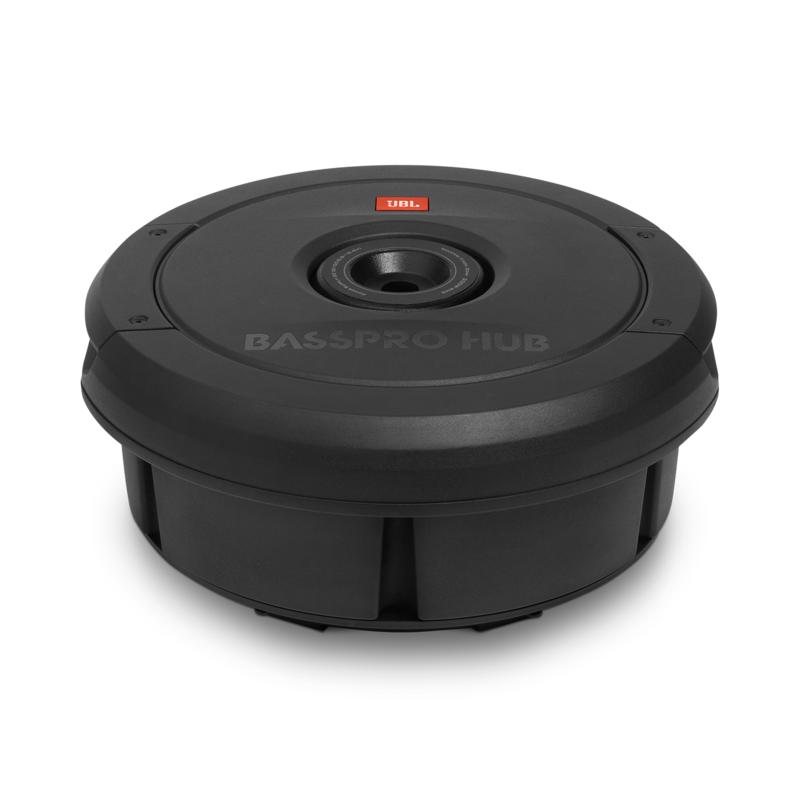 The new JBL BassPro Hub subwoofer delivers show & shine performance without crowding your passengers or sacrificing cargo area. 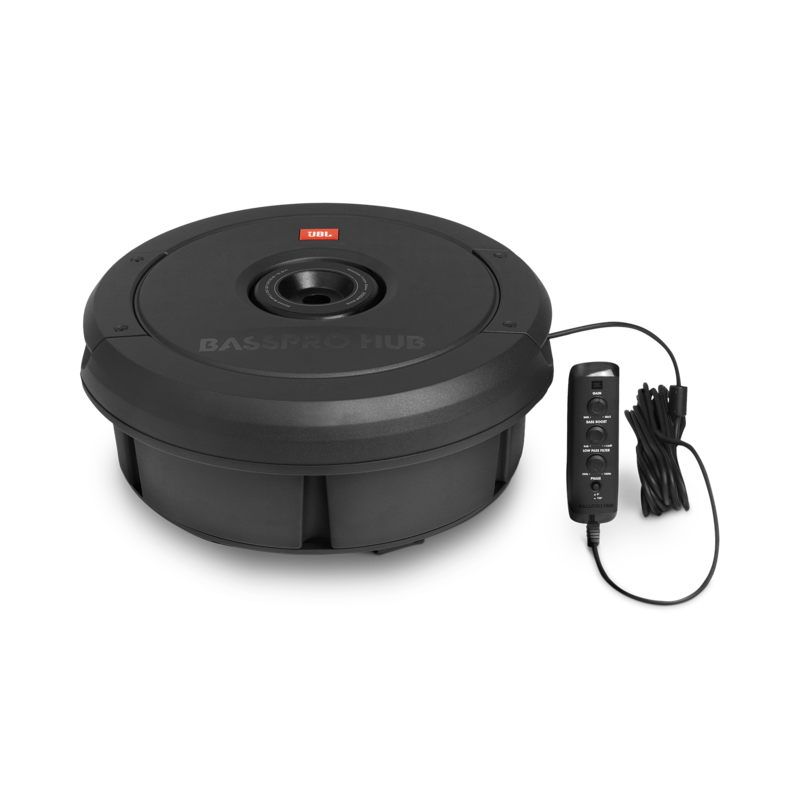 This all-in-one powered subwoofer system fits into the hub of your spare tire for a super easy installation and out of sight sound solution. The built-in Class D amp delivers 200W RMS and is designed to work with the BassPro Hub subwoofer and enclosure as a system. The 11" (279mm) feather-light fiberglass woofer cone with rubber surround delivers the signature kick and punch of JBL bass. And with over temperature protection (OTP) and over current protection (OCP) you can count on reliability at peak volume levels. The included remote control enables adjustment of crossover point, gain, phase—and a bass boost of 12dB when you're in the mood and on the move. Whether you're cruising or competing, the JBL BassPro leaves the competition behind without missing a beat. 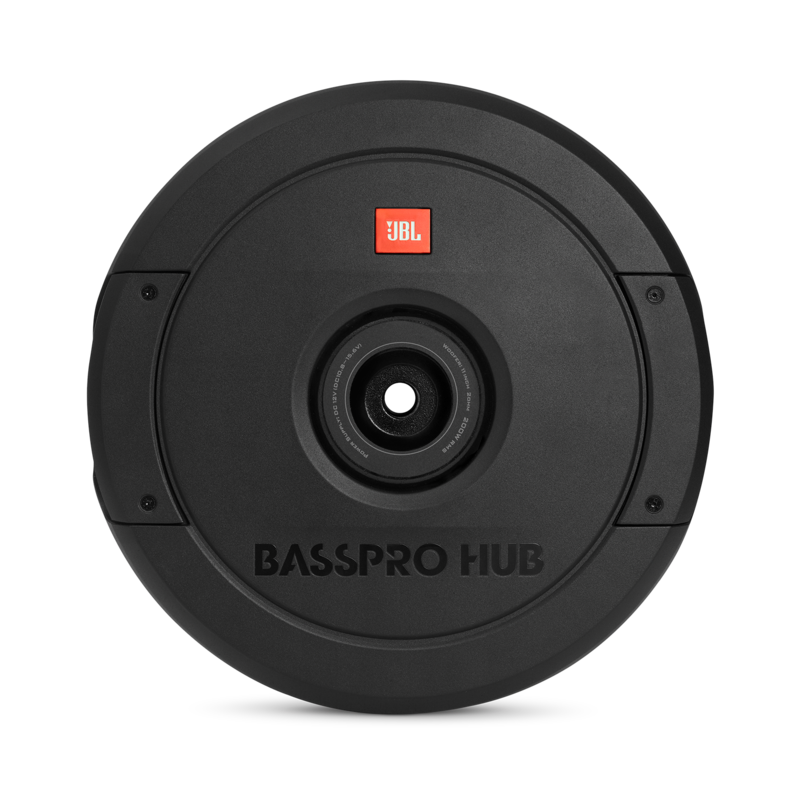 JBL BassPro Hub is rated 5.0 out of 5 by 2. Rated 5 out of 5 by Pelleplutt from Vilken total överraskning. Denna bas är exceptionellt kraftfull! Hur mycket jag än vrider upp volymen hänger den med. Och nog skakar backspegeln. Bigtime!! Kompisarna pratar om att ljudet liknar det på clubben. . Rated 5 out of 5 by Dickens from Does the job! Very well indeed Lovely unit. Shakes the car. Does not take space. Lots of options with the supplied controller. Is 8 gauge sufficient for a power wire or should a thicker gauge be used? That's plenty. According to one calculator, this amp draws 28 amps. Hence the 30 amp fuse. The same calc shows 10 gauge is good for up to 35 amps at up to 16'. If you tap your existing speakers and use the high level input on the unit, no. It has voltage sensing so it's automatic. Basically, amps with high level inputs have a built-in loc. Would this fit in the spare (mini spare type) of a 2003 Miata? Unfortunately, we can't verify if the BassPro Hub would fit your 2003 Miata, though if the location where you plan to put it is 11&quot; in diameter, then it should fit in theory; otherwise, you may need to do a custom install. If using the high level input, do you still need a remote turn on wire? I want to use my factory stereo and just tap into the existing speakers. You do not need to hook-up a remote when using high-level speaker inputs. The sub's amp will automatically turn on when it senses signal from the speakers. Does the remote control need to remain plugged in at all times? I would like to set the gain, crossover and boost and have the amp retain the settings after I unplug the controller. Please confirm.